We are proud to announce the publication of a paper co-authored by high school students and Our Solar Siblings members titled “Photometric and Proper Motion Study of the neglected open cluster NGC 2215”. This research emerged from the curriculum materials used in Our Solar Siblings. The paper itself is published in the June issue of one of the world’s premiere astronomical research journals, the Astronomical Journal . It is also available on arxiv. 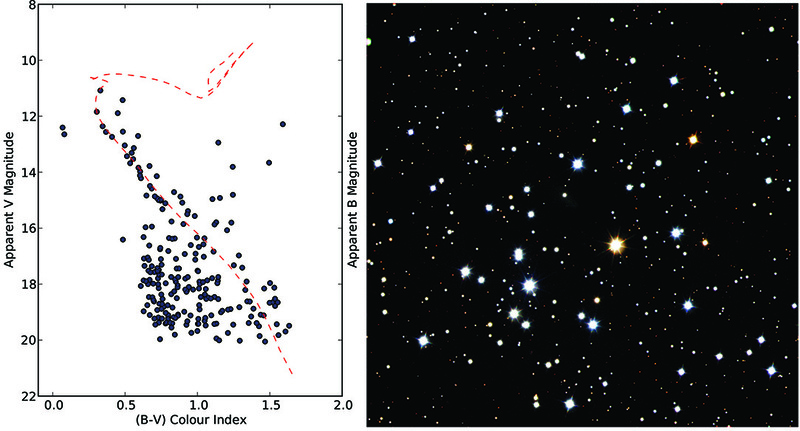 Above: The Open Cluster, NGC2215, represented by a colour image on the right and the main scientific representation of the same image on the left. Back in the dim dark past of 2010, the first draft of the curriculum materials that form the backbone of Our Solar Siblings were being beaten together by Michael Fitzgerald and David McKinnon. The materials were intended to be used in the Australia Research Council funded project called Space to Grow at Macquarie University. The first run of these materials were trialled at a teacher professional development day in early October 2010, and the first actual in-class trials of the materials were run at the end of that year with Year 10 students at Denison College Bathurst High Campus as well as at West Kildonian Collegiate in Winnipeg, Manitoba, Canada. At the Bathurst High Campus, 15 students were recruited to participate during the last two weeks of the school year and after all external examinations had been completed. Four meetings were run during the morning sessions with computers being managed by the Librarian so that we could use Google Docs. The Head of Science also attended and helped with practical activities involving access to remote parts of school, e.g., the inverse square necessitated access to the photography dark room. In this class was a budding young Year 10 student (star of the video below!) who had planned to undertake Japanese and Music in her senior studies during Year 11 and 12. Little did she know that she would be changing her course options so soon! She is now in third year at University of New South Wales undertaking a combined Bachelor of Science and Bachelor of Education, intending in 2017 to start teaching, of which Our Solar Siblings will form a part. After running through the in-class materials she wanted to go beyond the class materials and undertake research on an open cluster that was fairly neglected in the literature, NGC 2215. McKinnon did the literature searching and analysis of what had been published by other astronomers. The range of previous estimated distances ran from 980 to 1932 parsecs (3200 to 6200 light years), with ages from about 40 million years to 630 million years, with estimated sizes on the sky from a tenth to just over half a degree. The main problem really lay in lower quality data, not necessarily in poor interpretations. She communicated with senior students in Canada and they collaboratively and cooperatively worked on the analysis. Above: The Entry into Sleek Geeks Eureka Prize by Lead Student Author, Lauren Inwood. To tackle this problem, the 2-metre Faulkes Telescope North, run by the Las Cumbres Global Telescope Network, was used to collect high-quality optical Ultraviolet, Blue, Visual (Green), Red and Infrared images of the cluster. Lauren, in collaboration with the students and their teacher in Canada (Mr Rob Edwards, Bailey Scott and Matt Zolinski) and Dr Lena Danaia at Charles Sturt University, ran through some initial tests of the photometric method, and produced and analysed some early Colour Magnitude Diagrams (similar to HR diagrams). It was clear from this early point that, when viewed as a normal solar-type open cluster, the interpretations of the measured data were not simple. Over the next year and a half, Michael and Lauren, with huge amounts of help from Professor Wilton Dias from UNIFEI in Brazil and Mariana Sacchi, also from Brazil but now Our Solar Siblings’ data scientist, went through a cyclical process of refining and re-interpreting the data. More clarity was achieved by removing stars from analysis that had significant differences in their Proper Motion compared to those hypothesised to be in the cluster. The size of the cluster was also more precisely estimated such that stars outside the radius could be rejected. The optical data was supplemented by ground-based near-infrared (2MASS) and space-telescope mid-infrared (WISE) data as well as double-checked by another image acquisition run to acquire comparison optical data on the FTN. Russ Laher, at Caltech, was extremely helpful in updating his Aperture Photometry Tool (APT) to include capacity for different techniques of star and sky measurement that, in the end, outperformed (in this scenario) the astronomical gold standard measurement method, DAOPhot. Above: Logo for Aperture Photometry Tool, 2MASS and an artists’ conception of WISE. After a long process of refinement, reinterpretation and improvement with multiple ‘AHA!’ moments amongst the head-scratching, the final conclusion was that the colour-magnitude diagrams of NGC2215 presented two different stellar populations. The first population, which is outlined in the paper in detail, is confirmed to be an open cluster at a distance of 790 +/- 90 parsecs (2575 light years), with an age of roughly 700 million years but with significantly less metals (higher elements then Hydrogen or Helium) than the Sun. The second population, which for some time caused us, and earlier astronomers, much confusion, was interpreted as a much older, more distant (4000 parsecs/13000 light years) stellar population probably related to the Perseus spiral arm. The results, and their method, are published in the June 2015 edition of the Astronomical Journal, one of the world’s premier astronomical research journals. This is the first (hopefully of many) research papers emerging directly from the open cluster curriculum materials used in Our Solar Siblings project. Previous student research using similar methodology and using the 2-metre Faulkes Telescope South looked at variable stars in a globular cluster, NGC6101, was published with two Year 11/12 students and their teacher as co-authors. It is one of the primary goals of Our Solar Siblings to not only inspire and educate the general student population about their place in the universe, but to provide capacity for any student with intrinsic interest to undertake truly authentic astronomical research of their own. Brilliant. Just brilliant! It is great to see REAL science being done in schools and not cookbook stuff. ← Teacher Introductory Video Up on Vimeo.